We’re welcoming Gina Horkey to the blog today to share with us her own freelance expertise as a self-made freelance writer — and give us tips on how to start a freelance writing business from scratch. Gina started her own freelance business from scratch and grew it to a quit-your-job level in less than six months. 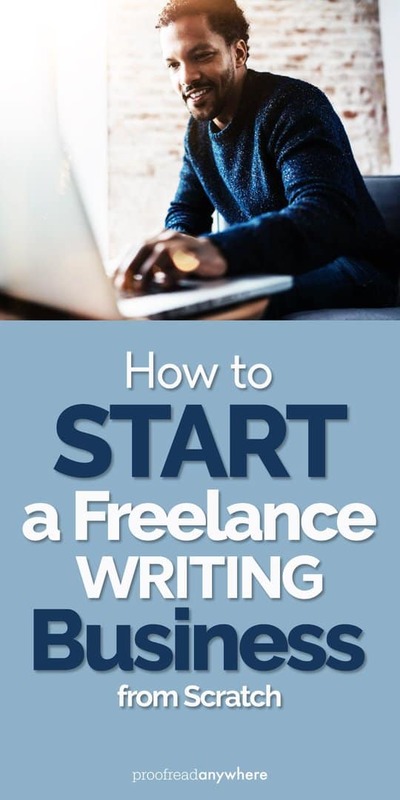 Now, in addition to her writing, she helps others start a freelance writing businesses from home via her freelance writing course, 30 Days or Less to Freelance Writing Success. I won’t spoil all the details! Enjoy the interview — and if you have any questions for Gina about this line of work (a sister business to proofreading! ), make sure to leave her a comment! Hi, Gina! Tell us a little about yourself and how you got started as a freelance writer. Hi! My name is Gina, and I’m a married millennial mama to two toddlers, one of which is just about to start preschool — eek! The short story is that I was discontent in my career as a financial advisor. I’d been doing it for almost a decade, was the primary breadwinner to our young family of four and felt a bit stuck. I had a great opportunity at the office, but I didn’t really enjoy the day-to-day work besides meeting with clients and helping them plan, work towards and achieve their goals. Luckily, I still get to do the latter when working with my current coaching clients. So after trying (and failing) to fall in love with my current career, I started aimlessly searching around the internet. My search results led me to Leaving Work Behind and freelance writing. I’ve ALWAYS loved to write and communicate via this medium. I just didn’t realize that non-fiction writing for the web was a viable career choice, especially since I hadn’t majored in Journalism. Regardless, I took the plunge, had some success and the rest is almost history! I built up my business enough where I felt confident putting in my notice and I’ve been freelancing full time since right after Christmas, 2014. It’s been AMAZING! RELATED POSTS Interested in making money writing? Be sure to check out these posts too! My favorite part is the flexibility. Although I keep pretty traditional work hours (8-5), I come in each day for lunch and to lay our two toddlers down for their naps (and sometimes I sneak one in ;-)). I would never have been able to do this last year! We also travel quite a bit (in-state) and it’s great not to have to ask for permission to leave early and beat traffic or take an extended weekend away. My least favorite part probably, is that it’s all on me. At this point, if I don’t work, I don’t get paid. And it gets a little stressful at times. I try to only concentrate on what’s in my control, keep my head down and work and not worry about the rest. Most times this strategy works just fine. How flexible is this type of work? Is it ideal for moms, as a side gig, digital nomads, etc.? Very flexible! Provided you hit your deadlines, it doesn’t matter when you work. I have a lot of SAHM students that are trying to build a side business as a freelance writer, and it’s perfect for them. It can be hard managing it all, but if you’re focused during the periods of time that you have available, you can achieve a lot! What’s the demand like for writers worldwide? What kinds of companies are looking for writers? Is the demand expected to increase in the next decade? I think the demand is huge. For more “hard data,” check out this fantastic post from Be a Freelance Blogger. It does a far better job answering the demand question than I could. One of my favorite quotes (I made it up ;-)) is this: “Every company needs a website and virtually every website needs a blog.” And I really believe it. Writing is a huge medium for connecting with consumers and in my opinion is only going to grow from here! Besides patience, what else is required to be successful in this type of business? Perseverance and a thick skin. You are guaranteed to get rejected, either by someone actually telling you no or just not responding to your pitch. And it’s totally okay. Don’t worry about it. It’s more of a numbers game than anything, but you have to be comfortable selling yourself. And I’ve found that it’s so much easier for me to do in this industry than my last one! Hopefully you feel the same. It might take awhile to gain some momentum, so keep with it. When you do, it’s AMAZING. Just don’t give up too soon! What’s the earning potential for freelance writing? Are some niches more lucrative than others? Your income potential is only limited by your time and expertise. I have a diversified freelance business, meaning I write; I am a high-end virtual assistant; I have a course for sale for aspiring freelance writers; and I coach freelancers too. It’s served me well — I grossed $10,000 for the first time last month. Others strictly write and make six figures. It depends on your effort, the clients you land, etc. Personally, I feel like I’d get burnt out just writing, so I enjoy the versatility. My background is in finance and that has proven to be lucrative. I think companies that are able to spend a lot on marketing (finance, healthcare, etc.) are more lucrative. It all depends on your experience and level of expertise, but you can learn to write in areas in which you’re not already an expert. It just takes some research! For those who are a good fit, how would you recommend they get started? I’ve got some great solutions for you! As I grew my own freelance writing business, I documented my journey. A lot was on the line (being able to change careers), so I took notes along the way in order to avoid living out the definition of insanity (trying the same thing over and over and expecting different results). As I built up my business and reflected on my notes, I realized I had a blueprint of sorts that could help others get started. So I sat down every morning and wrote a lesson or two for the month of November last year. When I was done, I had the first version of 30 Days or Less to Freelance Writing Success. More than 300 people have made their way through the material and have had some awesome things to say. So maybe check it out? Why not you, why not now? If you aren’t ready to jump into the course just yet, then check out my FREE resource list of 200+ freelance writing niches. It’s a great way to learn more about freelance writing AND help you hone in on a niche or two to specialize in at the same time. Do you have questions for Gina about her work as a freelancer or how to become a paid freelance writer? Leave her a comment below! Hi, Gina! I’ve signed up for Lesson 1, but cannot locate a price for the entire course. Thanks for the help! What sort of expenses do you incur as a freelance writer? Thanks for sharing this impressive post. It will be really helpful for people who are interested in a career in freelance writing.